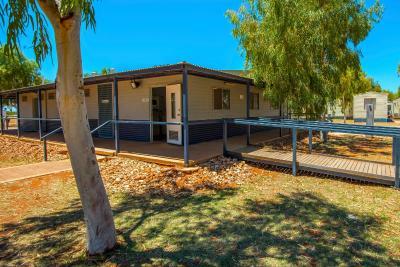 Lock in a great price for RAC Exmouth Cape Holiday Park - rated 8.3 by recent guests. Staff really helpful. Nice swimming pool although lacking a little in places to sit around the pool. Very clean. Good facilities. The room was nice and clean. Air con was great so was the TV and fridge. Shower and toilet were close to our room. Kitchen in camp was clean and large. Staff friendly & helpful. 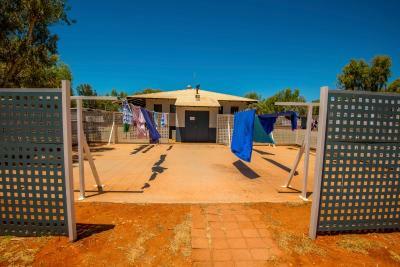 Good number of toilets and showers in ablution block. Quiet location. Comfortable beds with restful sleep. 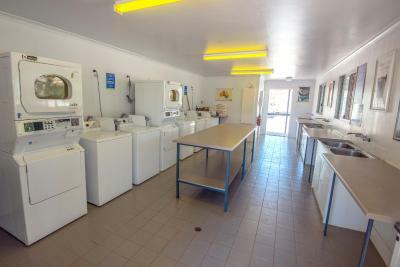 Everything it was really clean the location was great for me and I what I wanted plenty of showers and toilets nice and clean. And I arrived so early but my room was ready so they let me go in at like 9am ideal! Nice and cheap with all necessary facilities. Got a whole dorm to myself too! Staff are great. Very happy to help in any way that they can. Comfy clean dorms - when not busy they will spread everyone out across the dorms rather than cramping everyone in together. Nice pool and location on the main highway. Friendly staff. 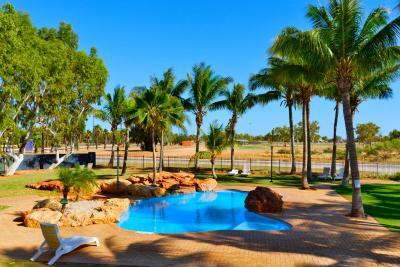 Situated at the gateway to Ningaloo Reef, this holiday park offers a variety of accommodation options, a swimming pool and children's playground. Guests can enjoy an outdoor cinema in the high season. 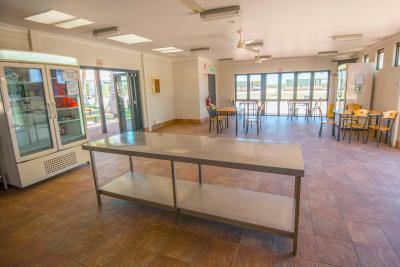 Exmouth Cape Holiday Park accommodation options include private rooms, dormitory rooms and deluxe cabins. Some accommodation include a patio or private en suite bathroom. 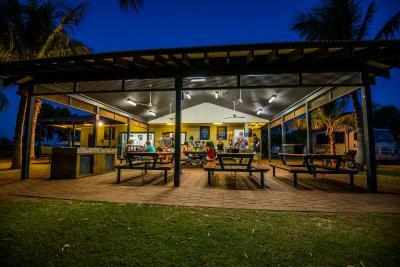 Guests can play a game on the beach volleyball court or enjoy an outdoor meal at the covered BBQ area. There is also shared kitchen and bathroom facilities. Exmouth Holiday Park is a 10 minute' walk from local shops and dining options. Exmouth Golf Club is 4 minutes' drive away. Ningaloo Reef offers fantastic snorkelling areas and is home to whale sharks, manta rays and turtles. 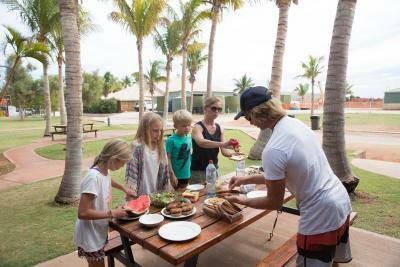 RAC Exmouth Cape Holiday Park has been welcoming Booking.com guests since 13 Jul 2010. When would you like to stay at RAC Exmouth Cape Holiday Park? This one bedroom cabin features a queen bed, air-conditioning, and a kitchen with a fridge, stove top and microwave. 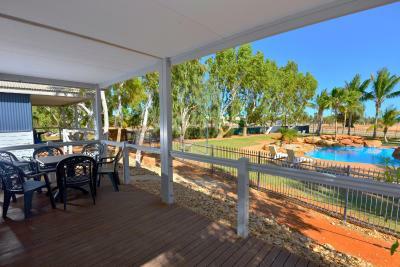 There is a bathroom, verandah with outdoor dining area, TV and DVD player. With views overlooking the pool, this 2 bedroom cabin offers one queen and two single bunks. It features air-conditioning, and a kitchen with a fridge, stove top and microwave. 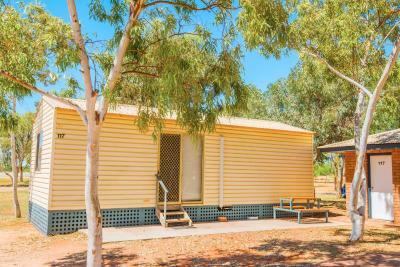 There is a bathroom, verandah with outdoor dining area, TV and DVD player. Please note that the price is based on 2 guests. Maximum occupancy is 4. (see Hotel Policies). This 2 bedroom cabin features one queen and one double bunk with a single overhead. It features air-conditioning, and a kitchen with a fridge, stove top and microwave. 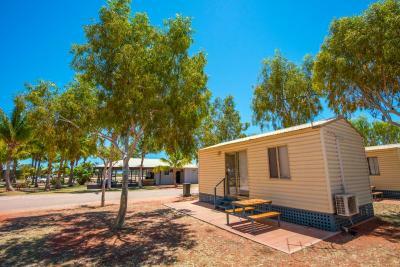 There is a bathroom, verandah with outdoor dining area, TV and DVD player. Please note that the price is based on 2 guests. Maximum occupancy is 5. (see Hotel Policies). This one bedroom cabin features a double and two single bunks. It features air-conditioning, and a kitchen with a fridge, stove top and microwave. 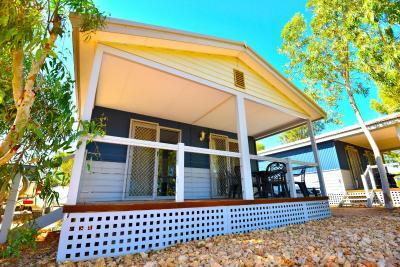 There is a external private ensuite bathroom, veranda with outdoor dining area, TV and DVD player. Please note that the price is based on 2 guests. Maximum occupancy is 6. (see Hotel Policies). This one bedroom cabin offers one double and two single bunks. It features air-conditioning, and a kitchen with a fridge, stove top and microwave. There is a veranda with outdoor dining area, TV and DVD player. Guests have access to the shared holiday park bathroom and facilities. This is a single bunk space in a one bedroom dormitory room with two bunk beds. It features air-conditioning, linen and use of shared holiday park bathroom and facilities. This room features a queen bed, air-conditioning, tea and coffee making facilities and use of shared holiday park bathroom and facilities. Please note that the price is based on 2 guests. There is no capacity for extra guests. This room has two single beds, air-conditioning, tea and coffee making facilities and use of shared holiday park bathroom and facilities. This cabin is ideal for families or a group of friends. Two bedroom. One queen and one double bunk with single overhead. 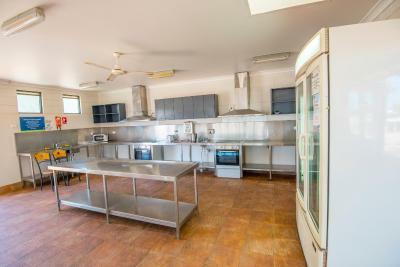 Features air-conditioning; kitchen with fridge, stove top and microwave; bathroom; veranda with outdoor dining; TV and DVD. This cabin is ideal for a family on a budget or a group of friends. One bedroom. One double and two single bunks. 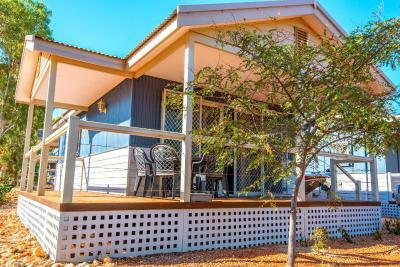 Features air-conditioning; kitchenette with fridge, stove top and microwave; external private ensuite bathroom; veranda with outdoor dining; open plan living with TV. 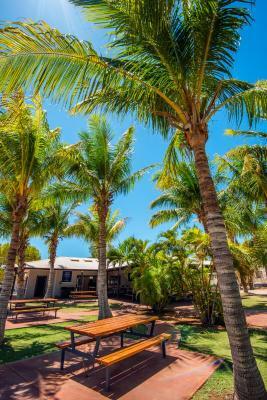 RAC Exmouth Cape Holiday Park is situated at the gateway to the Ningaloo Reef. 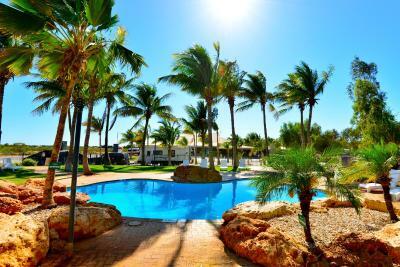 It is the ideal location for a family holiday. Exmouth has a warm climate all year round, with the summer months averaging in the 30s and a typical winter maximum reaching 25 degrees. 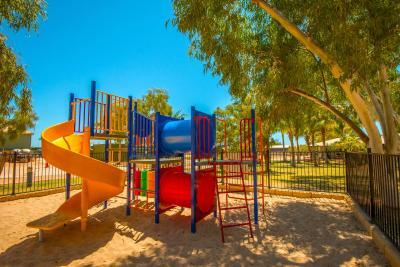 The park provides many useful facilities, including powered and un-powered sites, an outdoor swimming pool, cooking facilities and a playground. Customers can choose to stay in cabins or on the campsite. 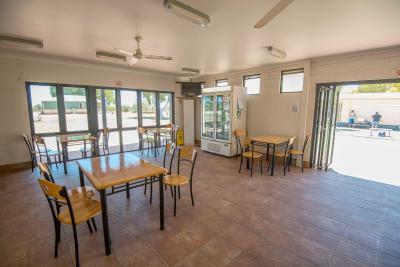 Exmouth Cape Holiday Park is easily accessible from the shuttle bus service that runs between Learmonth airport and Exmouth. House rules RAC Exmouth Cape Holiday Park takes special requests - add in the next step! RAC Exmouth Cape Holiday Park accepts these cards and reserves the right to temporarily hold an amount prior to arrival. Please note that there is no capacity for additional guests. Children can be accommodated only when included in your booking, and within the maximum occupancy of the room. Your reservation may be cancelled with a penalty fee if you arrive with additional children. Bathrooms were really hot/stuffy but given the conditions and time of year I don't think there's much could be done about that. Couldn't open the curtains easily. Noisy neighbour in the morning and evening on last night. Very clean and staff were brilliant! Room needs to be cleaned better, under bed full of dust, shelves with dust. Not nice to have to clean everything before using it. (it looked clean but really it wasnt). Air con in the bedroom was noisy and didn’t work that well. Bathroom had mild in the grout, tap fittings dropped and very worn. Floor coverings have shrunk dirt in corners and red dust on the red dust and minimal crockery even for just two people. the tv was on top of the fridge where you couldn’t really sit and watch it , it would have been much better in the bedroom . the air con was great in the little kitchen but both the bedrooms were extremely hot . one tap in the tiny kitchen that only spat out hot water . great location , very comfy beds . We booked a cabin with shared facilities. It was a little frustrating that there were signs all over the cabin stating “extra cleaning required will incur a cleaning fee” We paid nearly $90 a night for what was essentially a bed. The least they can do is clean up at the end of our stay so we are not required to sweep the entire cabin etc. Very poor value for money.